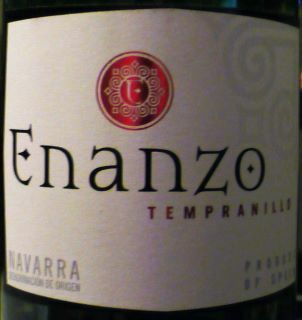 RECOMMENDED: Enanzo Tempranillo 2009, Navarra, Spain. 13.5% ABV. Available for as little as $5.99. First impression: Dark ruby red. Nice clarity. Great legs. Round molasses taste, yeast-roll finish. Second impression: More oak, more jammy, more pepper, less round. Third impression: Gentler, less spicy, tannic, leather. It really does have a lovely nose. This is a basic but good dry red table wine at a price that can’t be beat. Usually we taste our wines without food so we understand what the pure wine is like without distractions. This one was just-okay by itself, so we do recommend pairing this with something sweet and meaty such as BBQ. LABEL NOTES: From our oldest Tempranillo vineyards, we select those grapes which we know will provide a wine which retains its fruity, fresh character, achieving equilibrium between the quality of the harvest and the age of the vineyards. The result is an intense, cherry red colour, with a violet iridescence. Fresh aromas of dark fruits on the nose; cherry, plum and black currants define the body. Smooth. Well-balanced. Silky texture. Enanzo is a fruit-driven wine with an excellent tannic structure. This entry was posted in Spain, Tempranillo. Bookmark the permalink.